2017 has been declared as the Year of Sustainable Tourism and Development by The United Nations General Assembly and for Platinum Heritage, this is music to our ears. There are many elements that contribute to sustainability including environmental, cultural and the economic benefits to the local community. These need to balance current needs without compromising the ability of future generations to meet theirs. 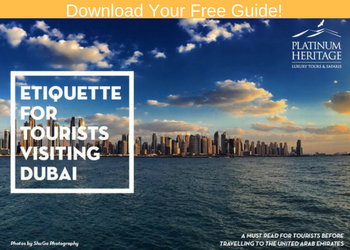 We are happy to share our continuous efforts on all our desert safaris to promote and educate our guests on sustainable tourism in Dubai. When Platinum Heritage started, our emphasis was on the preservation of culture and heritage of the region. We felt international visitors were being misled about Emirati heritage and culture when elements such as belly dancing, tanoura dancing, and chugging a beer over a plate of spaghetti bolognaise were ‘borrowed’ from disparate cultures and passed off as “traditional Bedouin activities”. We have abolished all these practices and replaced them with authentic activities that are unique and culturally correct. These activities include authentic Arabic coffee making, teaching Bedouin falconry, Emirati entertainment & cuisine, the use of traditional building materials and design in order to accurately recreate a Bedouin camp as well as introducing the first 4WD vehicle that arrived into the UAE, the Series 1 Land Rover. Through these practices and knowledge of the local history, we continuously strive to educate international (and local) guests and share a glimpse into the life of the Bedouins in the early years before modernization. Platinum Heritage has been established as the leaders in sustainable and is the only Desert Safari Company to have been awarded the coveted Green Tourism Award by Dubai Tourism. 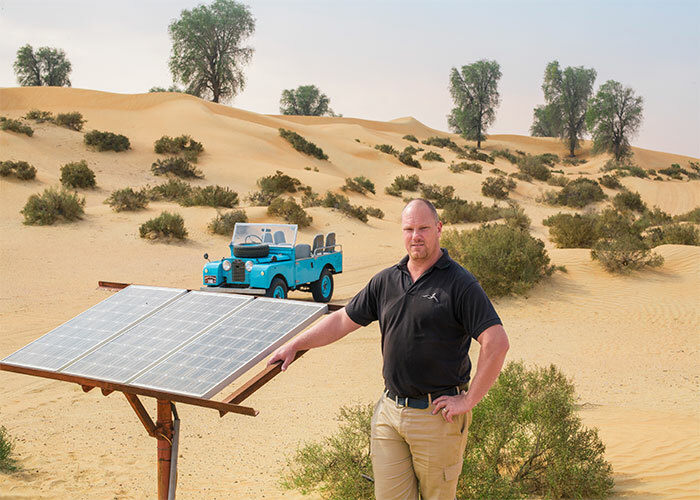 To date, we are the only company in the safari industry to educate the industry in regards to protecting the desert environment and took the bold step to become the only safari provider to remove dune bashing from a desert experiences. No company can truly call themselves “Green” when they participate in a daily activity that leads animals and plants towards extinction. About 90% of life in the desert can be found underneath the top layer of sand and it is this life that is being destroyed by dune bashing. From the inception of Platinum Heritage, we decided not to use generator or city power. We undertook a multi-strategy approach to our energy strategy which included the design of our camps using gravitational force to reduce energy requirements. For example, we elevated our water tanks, removing the need for a pump to move water around. Further research and procurement of low energy equipment such as refrigerators followed. The installation of LED lights that require a much lower demand for power were coupled with the installation of solar panels and batteries. This optimized system now provides 100% of our energy requirements. The first step in our waste management was to reduce the amount of waste generated. This is achieved by eliminating disposable materials as much as possible. Therefore, we never use plastic or paper products that have a single use, or cheap quality materials (plates, bowls etc.) that need to be replaced often. We also collect our food waste and create mulch for the palm trees and animal feed for the animals on the farm located inside our property. Fuel efficiency is only part of the equation when calculating a vehicles environmental impact. It has been estimated that around 30-40% of the total greenhouse gas emissions over the life of a vehicle come from its manufacture (up to 60% for a hybrid). Scrapping creates large quantities of non-recyclable plastics, toxic heavy metals, asbestos, CFCs, PCBs and rubber products, all of which have to be disposed of. One can argue that by keeping an old vehicle on the road instead of scrapping it and buying another one is a more eco-friendly option. 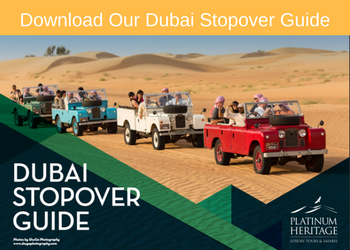 Since Land Cruisers and Hummers used for safari’s need to be replaced every 5 years in Dubai, this means that our Land Rovers have already saved 18 vehicles each from production and scrap of 270 vehicles collectively. We set out to create a sustainable tour operation as a priority rather than an evolving to it. We are proud of our status and the effort we have put in to make our operation the most sustainable and eco-friendly in the region.